Raw on $10 a Day (or Less! 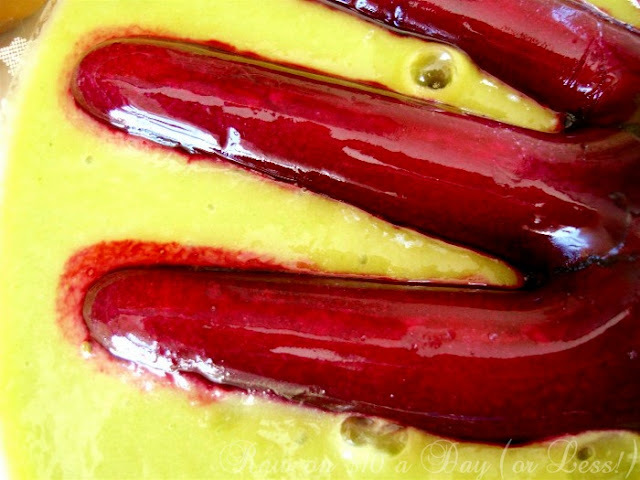 ): Witches Brew Smoothie ~ a Raw and Vegan Recipe for Halloween! A basic green smoothie can easily become witched brew. Add a beet hand for creepy effect. In a blender, with about a half cup water (or more, if needed), blend the romaine until very smooth. Even a small blender will do this well if the greens are blended first. 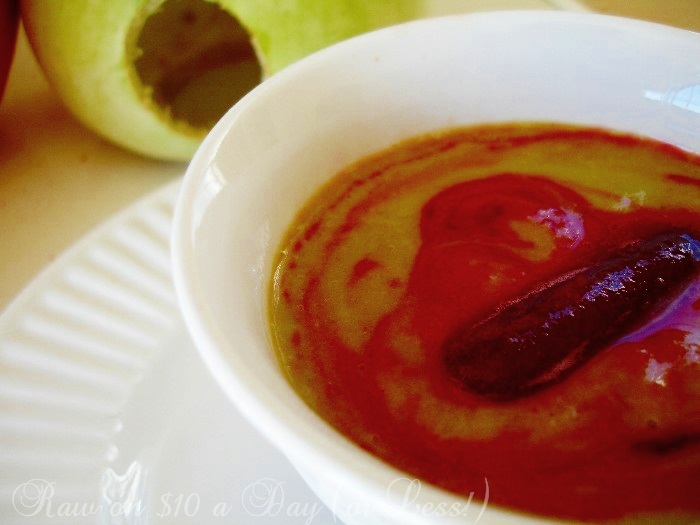 Add the banana and frozen mango and blend until smooth. Serve in a punch bowl or your favorite cauldron, if desired. For the hand you;ll need a latex glove. Rinse the inside of the glove well and fill with water and the beet juice. Make a knot in the top of the glove, or tie shut with a rubber band. Freeze for several hours or overnight, until frozen solid. Run under hot water for a second or two and then peel the glove from the hand. Put in the center of your witches brew. This serves four, so there are plenty of chilly fingers to go around. OMG that's SO cool er... creepy! ;) And I just LOVE-LOVE-LOVE your banner!!!!!!!!! Wow. Hahahaha! That sounds delicious but looks gross (in a good way). Hahaha that is so great - will definitely make this one on Halloween. Awesome! My grandkids loved it! What a great idea for Halloween. I love food like this! What an great idea for Halloween. Looks awesome - especially when the hand melts but does it taste good? If you like green smoothies, you'll love it! What a fun Halloween drink! So cool! Now I kinda wish I had kids to make this for. Awesome! I love to make a spooky ice hand at halloween! 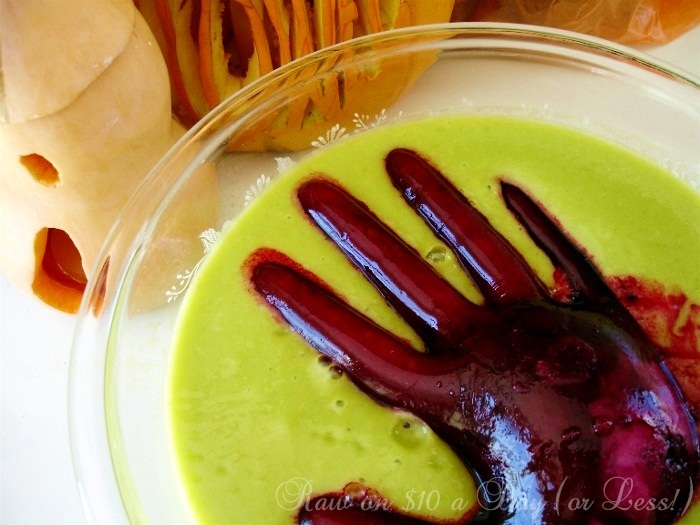 That beet hand looks so amazing and totally creepy at the same time! Hilarious! This is a MUST DO for Halloween!!! Thanks! I love this, Lisa! I recently made my own "green slime" with spinach, banana and vanilla - delicious! oh wow, Really awesome great creativity and nice though of view on things around us.Good work keep it up. Wow, that's so cool! The hand is such an awesome touch! Oh my goodness this is so fun!! This is an awesome idea. The the glove is inspired and the color contrast is great. Reallу nο matter if someonе doesn't understand after that its up to other visitors that they will help, so here it takes place. The first time I saw this, I didn't even think about what was in it. Now, I read the recipe closer, and I think that this would be so delicious! The beet juice would totally sweeten the green smoothie! I plan on making this soon! This is so cool! I'm definitely making it this year. Just included it in my Halloween recipe round-up - check it out if you're interested.